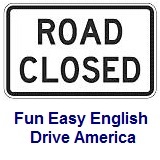 ﻿ Fun Easy English - Drive America - United States of America road signs, rules, and regulations warning, train. Warning road signs for railroads regulate traffic interaction with trains and railroad tracks. Warning road signs for light rail transit regulate traffic interaction with trains and railroad tracks. Indicates the presence of a light rail transit crossing. Indicates the presence of light rail transit. Condition is 200 feet ahead. Condition is 60 meters ahead. Railroad tracks are located before the intersection ahead. Railroad tracks run diagonally across the road. Railroad tracks run parallel to the road and cross the intersection ahead. There is a distance of 100 feet between the railroad tracks and the highway. There is a distance of 30 meters between the railroad tracks and the highway. There is a distance of 150 feet between the highway and the railroad tracks behind the road user. There is a distance of 45 meters between the highway and the railroad tracks behind the road user. Trains may travel at speeds of 80 miles per hour (mph) or more. Trains may travel at speeds of 130 kilometers per hour (kmh) or more. Indicates road users should use next crossing. Indicates road users should expect a rough crossing. Advises road users that the railroad crossing has no gates or lights. Advises road users that the railroad crossing has no signal. Advises road users that the trains passing the railroad crossing do not use a train horn.